Mosquitoes are found almost everywhere and almost everyone has experienced the irritation of a mosquito bite. Ross River, Barmah Forest, Murray Valley Encephalitis, Kunjin, Yellow fever, Dengue Fever and Japanese Encephalitis virus infection, Malaria and Filariasis (Elephantiasis) (to name a few!!) are all transmitted by mosquitoes are all best avoided. Mosquitoes tend to bite between dusk and dawn but some, like the Aedes mosquito which can spread Ross River and Barmah Forest virus and Dengue Fever do bite during the day. In Australia, we often refer to “sandflies” but such “sandflies” are really midges (see below). Sandflies are tiny insects sometimes called "no see ums"
They tend to bite at night and the bite is intensely itchy and irritating. These tiny beasts spread sand fly fevers and a serious disease called leishmaniasis. They are small enough to fit through a mosquito net so make sure your net is impregnated with an insecticide like permethrin. Ticks inhabit grass or scrub land vegetation, often in wooded or forested areas. When they are hungry for blood they crawl up the leaves of plants and attach to passing people or animals. When biting they stay strongly attached to the skin for many hours and are difficult to detach. They can transmit a number of diseases including Tick-Borne Encephalitis, Spotted Fevers and Lyme Disease. Midges are often referred to in Australia as “sandflies” but really they are “midges”. Midges are swarming insects that will be familiar to anyone who has visited the coastal areas during the summer months. Bites from these swarming clouds of midges can make life almost unbearable. Midge bites commonly get infected especially in children who scratch them because they are so itchy. Leeches are not usually thought of in the same category as biting insects, but leeches have a real “yuk” factor. 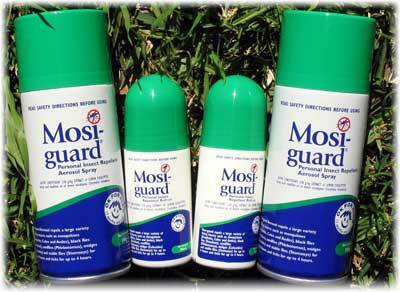 Scientific tests in leech-infested areas prove that Mosi-guard is also a very effective leech repellent! Body parallel to wall with head bent down. Bite not usually painful, but normally causes local reaction lasting hours to days. Dengue occurs in Far North Queensland and may be fatal. Ross River Virus occurs throughout Australia and causes an acute illness with rash & arthritis. Fatigue and other symptoms can last months or years. Bite not usually painful, but normally causes local reaction lasting hours to days. See above for Ross River Virus. Biting Flies " March Flies" "Stable Flies "
"Paralysis Ticks" "Shellbacks", "Bush Ticks"
Reference: "Taking the Mystery out of Malaria" Dr BJ Hudson, Dr K Donovan. Available from MASTA.